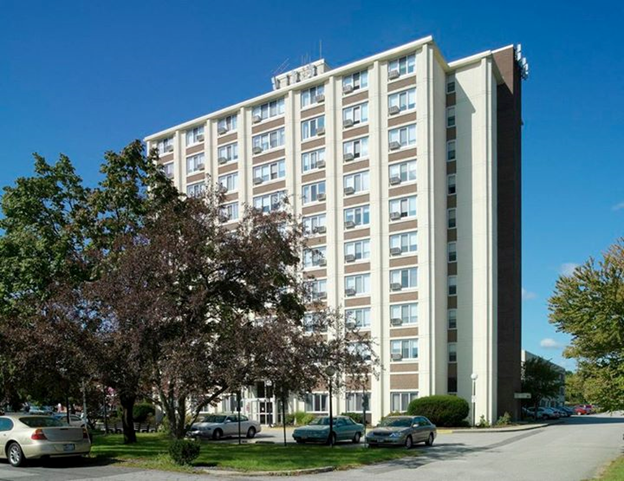 Located in a residential area of East Providence, Winslow Gardens towers above the neighborhood with its ten story building offering a fantastic view of either the city of Providence or the East Providence neighborhood. All the independent living apartments include a private bath and kitchen. They vary in price depending on the apartment’s size: efficiency, alcove or one-bedroom. Rental prices and income guidelines are set by the Department of Housing and Urban Development. Shared with the building’s assisted living residents, community space includes an all-purpose library and media room where many activities take place. In the warmer weather, you might relax in the sunroom listening to the water falling over rocks, then wander out onto our patio and enjoy the lush garden of flowers, plants and shade trees. In the winter months, you might prefer to hang out by the sunroom’s fireplace. Meal plans and other services such as housekeeping may be purchased for an additional fee and are billed monthly. Lunch is the most popular meal of the day as many residents socialize in the dining room. The menu is quite satisfying – and the chef often receives kudos! For a sample menu, visit our page about Dining at Winslow Gardens. The team members who work at Winslow Gardens go the extra mile in everything they do. Unlike other local senior housing, there are full time service coordinators on staff to help coordinate services such as housekeeping, transportation, maintenance repairs and other concerns. Our maintenance staff members are in the building Monday through Friday and on call nights and weekends. Other services include weekly religious services, and hair salon. Our vibrant activities department provides daily opportunities to become involved in the community around you, whether it be shopping or taking in a movie, going on a mystery ride or a planned outing, as well as onsite exercise classes, Bingo, crafts and so much more. See our calendar of Activities at Winslow Gardens. On Fridays, Saturdays and Tuesdays, the hairdresser is on duty at the salon located on the first floor of the Linn Health & Rehabilitation. Religious services take place weekly in our multipurpose room, as well as in our chapel at Linn Health & Rehabilitation. Linn Health & Rehabilitation is accessed through an indoor hallway, which makes visiting friends in the nursing home an easy task. At Winslow Gardens, we offer the flexibility of moving from an independent living apartment to an assisted living apartment with little to no disruption of one’s social circle, since all units are in the same building and share common space. Should one need short term rehab or longterm nursing care, Linn Health & Rehabilitation provides both and is adjacent to Winslow Gardens. We are an equal opportunity provider of housing for low to moderate income seniors age 62 or older. For more details please contact us. Income eligibility follows the guidelines set forth by the Department of Urban Development (HUD). We welcome prospective residents and family members to visit us, take a tour, and find out what Winslow Gardens has to offer. Please contact the Administrator of Winslow Gardens. See the Application for Admissions (for both Independent and Assisted Living) at Winslow Gardens. See the Winslow Gardens Independent Living Admissions Checklist. NOTE: Some of the services listed below are available at additional cost to residents. Please contact us for more information.